These LEDs have an intensity that follows Lambertian distribution, which means that the intensity of the LED is proportional to cos(angle), making it very simple to put inside the calculator. 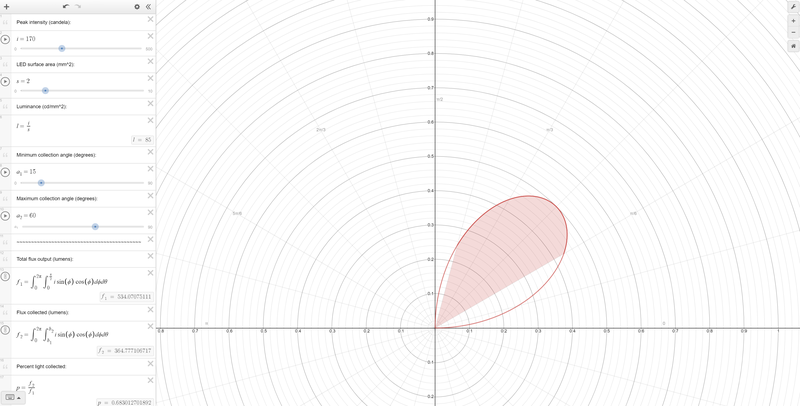 If the LED does not follow the Lambertian distribution, a special function needs to be used instead of cos(). Here you can see that flat LEDs have almost a perfect Lambertian distribution (orange line), although the intensity drops slightly faster at large angles near 90 degrees, so the lumen numbers given by the calculator are a slight overestimate. 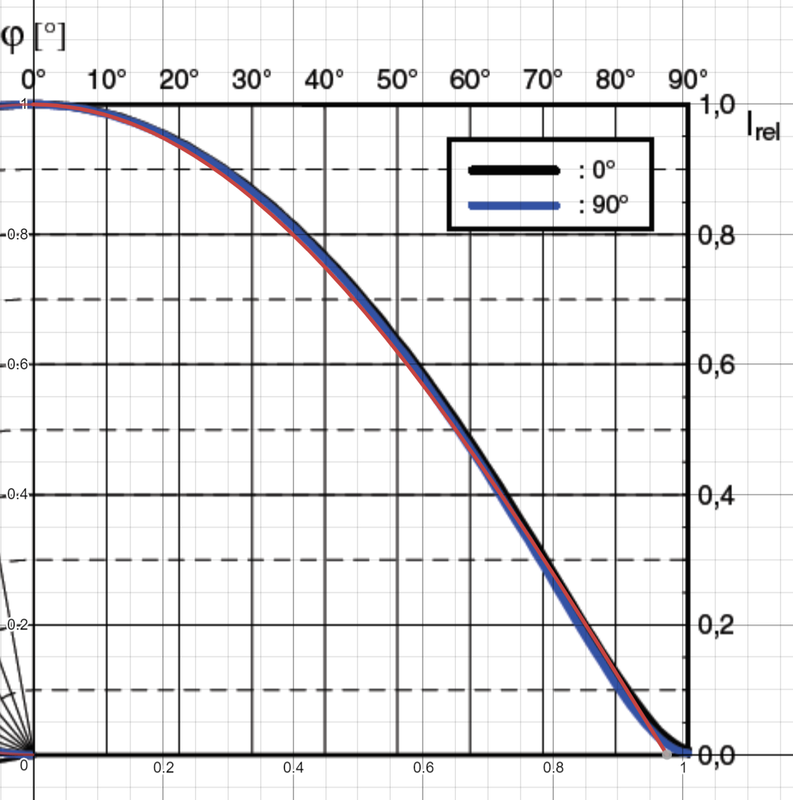 By setting the intensity (candela) and LED die size based on test or datasheet info, the luminance is calculated (cd/mm^2) and then you can adjust the min and max angles of light collection. For example, the CSLPM1.TG has 171cd and 515 lumens at spec. If we put 171cd intensity and 1.59*1.25 = 1.9875mm^2 die size we get 86cd/mm^2 and 537 total lumens. As I mentioned earlier this is a slight overestimate because of what you can see in the first image. Putting that into the calculator then gives 514 lumens, extremely close to the 515 spec. If we do the CSLNM1.TG, we get 324.5 lumens from the calculator, again very close to the rated 325 lumens. 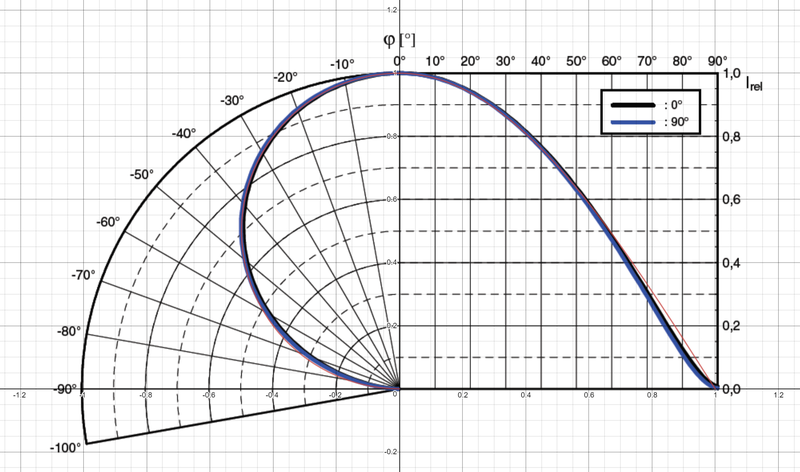 If you want to do other LEDs that don’t have lambertian distribution you need to take a screenshot of the datasheet relative intensity graph, overlay it on the desmos calculator with some transparency, adjust the size so that it matches, then use trial and error to modify the cos() function until the orange line matches the image from the datasheet. For tests done by people like koef3 and others, usually they list luminance (cd/mm^2) instead of directly candela, so you can just manually change the luminance to a number and then change the intensity to “l*s” and then you can adjust the luminance slider instead. I just thought it was easier to have the candela as the slider, because that’s the number you get when you measure with your lux meter at 1m distance, and the calculator does the conversion to cd/mm^2 for you when you put in the die area from the datasheet. Thanks! I don’t understand any of it, but I’m subbed in case I need it in the future!